As I have explained before, Laughs By Volume is essentially a comedy show featuring six comedians and unlimited pours of craft beer from about 25 breweries. The breweries on tap for Laughs By Volume III include The Dudes’ Brewing, Stone Brewing, Absolution Brewing, Four Sons Brewing, Mission Brewery, El Segundo Brewing, Great Beer Co., Smog City, Refuge Brewery, Timeless Pints, Anaheim Brewery, Three Weavers, Eagle Rock Brewing, Telegraph Brewing, Tahoe Mountain Brewing, 21st Amendment Brewery, The Lost Abbey, AleSmith Brewing, Brewery Ommegang, Boulevard Brewing, Anthem Cider, Maui Brewing, Avery Brewing, Double Mountain Brewery, Brouwerij Wolf, and Sixpoint Brewery. If history has taught me anything, this list will be modified in the next month so you might want to follow the Laughs By Volume Facebook page for updates. 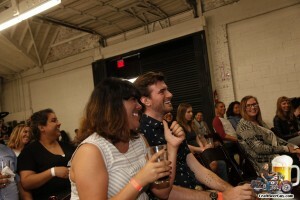 The comedians scheduled to appear at Laughs By Volume III include Martin Montana, Daniel Storrow, Jeff Capri, Lance Paullin, Melissa Shoshahi, and Chad Shapiro. Tickets for Laughs By Volume III are $30.00 at the door or $25.00 if you purchase them online. Naturally, I have a discount for you; use Promo Code CBG23 to save 10%. Included in the price of admission you get a souvenir PINT glass, unlimited pours and a gift bag containing coupons, products and special offers from their participating sponsors valued at $300. 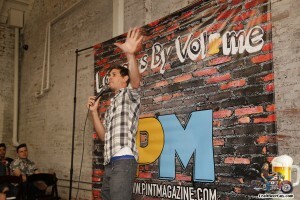 Laughs By Volume III will be held from 4:00 to 7:00 PM at Honeypot LA, located at 212 W. 12th Street in Los Angeles. Once again, LYFT is providing free rides to and from Laughs By Volume for those within 7 miles of the venue; if you live further then you will receive a discounted ride. To get the discount, simply enter code PARTYCAR after clicking payment. This venue has limited capacity, so only 150 tickets will be sold; do not delay, buy your tickets today! I hope to see you there. Cheers!